Update note: Mark Struzinski updated this tutorial for Xcode 10 and Swift 4.2. Maxime Defauw wrote the original. As a modern, high-level programming language, Swift handles much of the memory management of your apps and allocates or deallocates memory on your behalf. It does so using a feature of the Clang compiler called Automatic Reference Counting, or ARC. 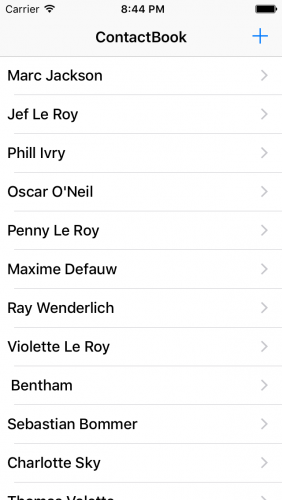 In this tutorial, you’ll learn all about ARC and memory management in Swift. With an understanding of this system, you can influence when the life of a heap object ends. Swift uses ARC to be predictable and efficient in resource-constrained environments. ARC works automatically, so you don’t need to participate in reference counting, but you do need to consider relationships between objects to avoid memory leaks. This is an important requirement that is often overlooked by new developers. What reference cycles are and how to break them. An example of a reference cycle in practice. How to detect reference cycles with the latest Xcode visualization tools. How to deal with mixed value and reference types. Click the Download Materials button at the top or bottom of this tutorial. In the folder named Cycles, open the starter project. For the first part of this tutorial, you’ll be working completely inside MainViewController.swift to learn some core concepts. This defines a class User which has print statements to show when you have initialized or deallocated it. Now, initialize an instance of User at the top of MainViewController. Build and run the app. Make sure the console is visible with Command-Shift-Y so you can see the result of the print statements. Notice that the console shows User John was initialized and that the print within deinit is never called. This means that the object is never deallocated because it never goes out of scope. In other words, since the view controller that contains this object never goes out of scope, the object is never removed from memory. Wrapping the instance of user in a method will allow it to go out of scope, letting ARC deallocate it. Create a method called runScenario() inside the MainViewController class. Move the initialization of User inside of it. runScenario() defines the scope for the instance of User. At the end of this scope, user should be deallocated. The initialization and deallocation print statements both appear. These statements show that you’ve deallocated the object at the end of the scope. Allocation: Takes memory from a stack or heap. Deallocation: Returns memory to a stack or heap. There are no direct hooks into allocation and deallocation, but you can use print statements in init and deinit as a proxy for monitoring those processes. Reference counts, also known as usage counts, determine when an object is no longer needed. This count indicates how many “things” reference the object. The object is no longer needed when its usage count reaches zero and no clients of the object remain. The object then deinitializes and deallocates. When you initialize the User object, it starts with a reference count of one, since the constant user references that object. At the end of runScenario(), user goes out of scope and the reference count decrements to zero. As a result, user deinitializes and subsequently deallocates. In most cases, ARC works like a charm. As an app developer, you don’t usually have to worry about memory leaks, where unused objects stay alive indefinitely. But it’s not all smooth sailing. Leaks can happen! How can these leaks occur? Imagine a situation where two objects are no longer required, but each references the other. Since each has a non-zero reference count, neither object can deallocate. This is a strong reference cycle. It fools ARC and prevents it from cleaning up. As you can see, the reference count at the end is not zero, and even though neither is still required, object1 and object2 are never deallocated. This adds a new class called Phone. It has two properties, one for the model and one for the owner, with init and deinit methods. The owner property is optional, since a Phone can exist without a User. This creates an instance of Phone. This adds a phones array property to hold all phones owned by a user. The setter is private, so clients have to use add(phone:). This method ensures that owner is set properly when you add it. Build and run. As you can see in the console, the Phone and User objects deallocate as expected. Here, you add iPhone to user. add(phone:) also sets the owner property of iPhone to user. Now build and run, and you’ll see user and iPhone do not deallocate. A strong reference cycle between the two objects prevents ARC from deallocating either of them. To break strong reference cycles, you can specify the relationship between reference counted objects as weak. Unless otherwise specified, all references are strong and impact reference counts. Weak references, however, don’t increase the reference count of an object. In other words, weak references don’t participate in the lifecycle management of an object. Additionally, weak references are always declared as optional types. This means when the reference count goes to zero, the reference can automatically be set to nil. In the image above, the dashed arrow represents a weak reference. Notice how the reference count of object1 is 1 because variable1 refers to it. The reference count of object2 is 2, because both variable2 and object1 refer to it. While object2 references object1, it does so weakly, meaning it doesn’t affect the strong reference count of object1. When both variable1 and variable2 go away, object1 will have a reference count of zero and deinit will run. This removes the strong reference to object2, which subsequently deinitializes. This breaks the User to Phone reference cycle by making the owner reference weak. Build and run again. Now user and phone deallocate properly once the runScenario() method exits scope. There is another reference modifier you can use that doesn’t increase the reference count: unowned. What’s the difference between unowned and weak? A weak reference is always optional and automatically becomes nil when the referenced object goes away. That’s why you must define weak properties as optional var types for your code to compile: The property needs to change. Unowned references, by contrast, are never optional types. If you try to access an unowned property that refers to a deinitialized object, you’ll trigger a runtime error comparable to force unwrapping a nil optional type. Time to get some practice using unowned. Name: Name of the subscription. CountryCode: Country of the subscription. User: Reference to a Userobject. 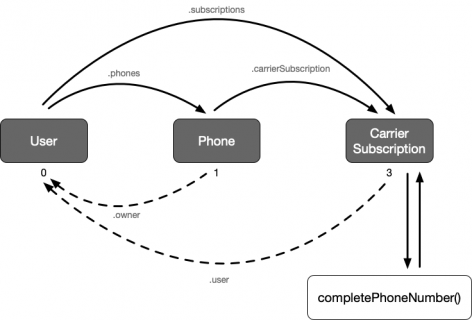 This adds a subscriptions property, which holds an array of CarrierSubscription objects. This adds an optional CarrierSubscription property and two new methods to provision and decommission a carrier subscription on the phone. This adds CarrierSubscription to the user’s array of subscriptions. This creates a CarrierSubscription for user and provisions iPhone with it. Again, you see a reference cycle: Neither user, iPhone or subscription gets deallocated at the end. Can you find where the issue is now? Either the reference from user to subscription or the reference from subscription to user should be unowned to break the cycle. The question is, which of the two to choose. This is where a little bit of knowledge of your domain helps. A user owns a carrier subscription, but, contrary to what carriers may think, the carrier subscription does not own the user. Moreover, it doesn’t make sense for a CarrierSubscription to exist without an owning User. This is why you declared it as an immutable let property in the first place. Since a User with no CarrierSubscription can exist, but no CarrierSubscription can exist without a User, the user reference should be unowned. user is now unowned, breaking the reference cycle and allowing every object to deallocate. Build and run to confirm. Reference cycles for objects occur when properties reference each other. Like objects, closures are also reference types and can cause cycles. Closures capture, or close over, the objects they operate on. For example, if you assign a closure to a property of a class, and that closure uses instance properties of that same class, you have a reference cycle. In other words, the object holds a reference to the closure via a stored property. The closure holds a reference to the object via the captured value of self. This closure computes and returns a complete phone number. The property is lazy, meaning that you’ll delay its assignment until the first time you use the property. This is necessary because it’s using self.countryCode and self.number, which aren’t available until after the initializer runs. Accessing completePhoneNumber() will force the closure to run and assign the property. 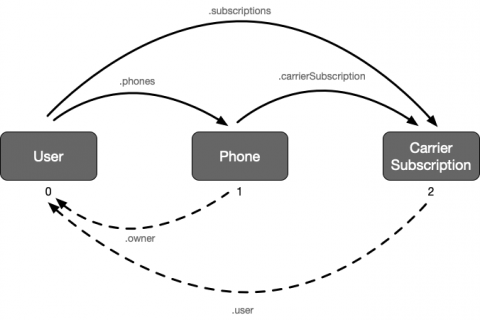 Build and run, and you’ll notice that user and iPhone deallocate, but CarrierSubscription does not, due to the strong reference cycle between the object and the closure. Swift has a simple, elegant way to break strong reference cycles in closures. You declare a capture list in which you define the relationships between the closure and the objects it captures. x is in the closure capture list, so you copy x at the definition point of the closure. It’s captured by value. y is not in the capture list, and is instead captured by reference. This means that y will be whatever it is when the closure runs, rather than what it was at the point of capture. Capture lists come in handy for defining a weak or unowned relationship between objects used in a closure. In this case, unowned is a good fit, since the closure cannot exist if the instance of CarrierSubscription has gone away. This adds [unowned self] to the capture list for the closure. It means that you’ve captured self as an unowned reference instead of a strong reference. Build and run, and you’ll see CarrierSubscription now gets deallocated. This solves the reference cycle. Hooray! Here, newID is an unowned copy of self. Outside the closure’s scope, self keeps its original meaning. In the short form, which you used above, you are creating a new self variable, which shadows the existing self variable only during the closure’s scope. In your code, the relationship between self and completePhoneNumber is unowned. If you are sure that a referenced object from a closure will never deallocate, you can use unowned. However, if it does deallocate, you are in trouble. The app hit a runtime exception because the closure expected self.who to still be valid, but you deallocated it when mermaid went out of scope at the end of the do block. This example may seem contrived, but it happens in real life. An example would be when you use closures to run something much later, such as after an asynchronous network call has finished. Here, you’ve made two changes to the original greetingMaker. First, you replaced unowned with weak. Second, since self became weak, you needed to access the who property with self?.who. You can ignore the Xcode warning; you’ll fix it shortly. Perhaps this result is acceptable in your situation, but more often, you’ll want to do something completely different if the object is gone. Swift’s guard let makes this easy. On the other hand, if self is not nil, it makes self a strong reference, so the object is guaranteed to live until the end of the closure. This idiom, sometimes referred to as the strong-weak dance, is part of the Ray Wenderlich Swift Style Guide, since it’s a robust pattern for handling this behavior in closures. Build and run to see that you now get the appropriate message. Now that you understand the principles of ARC, what reference cycles are and how to break them, it’s time to look at a real world example. 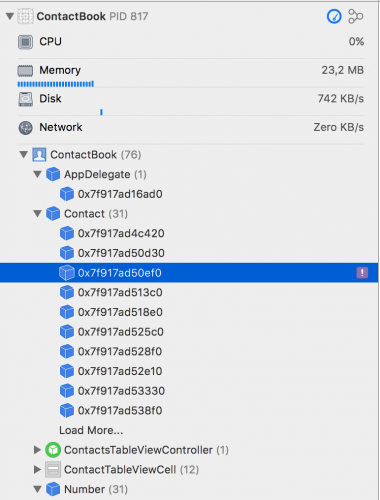 Open the Starter project inside the Contacts folder in Xcode. This is a simple contacts app. Feel free to tap on a contact to get more information or add contacts using the + button on the top right-hand side of the screen. ContactsTableViewController: Shows all the Contact objects from the database. DetailViewController: Shows the details for a certain Contact object. NewContactViewController: Allows the user to add a new contact. ContactTableViewCell: A custom table view cell that shows the details of a Contact object. Contact: The model for a contact in the database. Number: The model for a phone number. There is, however, something horribly wrong with the project: Buried in there is a reference cycle. Your user won’t notice the issue for quite some time since the leaking objects are small, and their size makes the leak even harder to trace. Fortunately, Xcode 10 has a built-in tool to help you find even the smallest leaks. Build and run the app again. 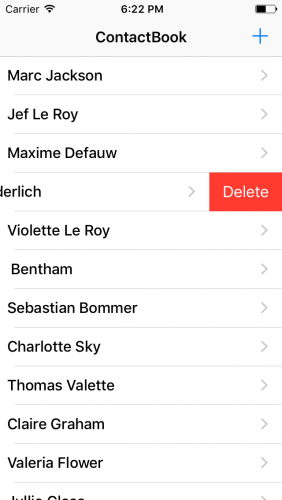 Delete three or four contacts by swiping their cells to the left and tapping delete. They appear to have disappeared completely, right? In the navigator, select one of the problematic Contact objects. The cycle is clearly visible: The Contact and Number objects keep each other alive by referencing one another. These issues are a sign for you to look into your code. Consider that a Contact can exist without a Number, but a Number should not exist without a Contact. How would you solve the cycle? Should the reference from Contact to Number or the reference from Number to Contact be weak or unowned? Give it your best shot first, then take a look below if you need help! 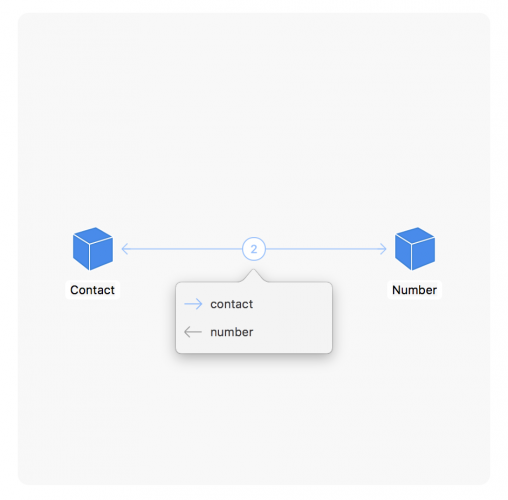 There are 2 possible solutions: You can either make the relationship from Contact to Number weak, or you can make the relationship from Number to Contact unowned. Run and debug again. You’ve resolved the issue! Swift types are reference types, like classes, or value types, like structures or enumerations. You copy a value type when you pass it, whereas reference types share a single copy of the information they reference. This means that you can’t have cycles with value types. Everything with value types is a copy, not a reference, meaning that they can’t create cyclical relationships. You need at least two references to make a cycle. Hmm, the compiler’s not happy. A struct value type cannot be recursive or use an instance of itself. Otherwise, a struct of this type would have an infinite size. Self reference is not an issue for classes (i.e. reference types), so the compiler error disappears. Build and run. Notice that neither Bert nor Ernie is deallocated. This is an example of a mixture of value types and reference types that form a reference cycle. ernie and bert stay alive by keeping a reference to each other in their friends array, although the array itself is a value type. Make the friends array unowned and Xcode will show an error: unowned only applies to class types. To break the cycle here, you’ll have to create a generic wrapper object and use it to add instances to the array. If you don’t know what generics are or how to use them, check out the Introduction to Generics tutorial on this site. Build and run. ernie and bert now deallocate happily! The friends array isn’t a collection of Person objects anymore, but instead a collection of Unowned objects that serve as wrappers for the Person instances. You now have a good understanding of memory management in Swift and you know how ARC works. If you want to learn more about the debug tools in Xcode 10, watch this WWDC session or check out chapter 2 of iOS 10 by Tutorials. If you want an even more in-depth look at weak reference implementation in Swift, check out Mike Ash’s blog post Swift Weak References. It covers how weak references in Swift differ from the Objective-C implementation, and how Swift actually keeps two counts under the hood: One for strong references and one for weak references. Finally, if you are a raywenderlich.com subscriber, check out the iOS 10 Screencast: Memory Graph Debugger. These tutorial gives some great tips for getting the most out of the memory visualizer. What do you think about the ARC approach? Share your thoughts in the comments!